Did Lancia change the heads, also? But of course…. One aspect of Aurelias is figuring how things change through its life. For us in America, the later series cars are far more common, with the 2.5 liter motors. Series 3 are rare, series 4 are desired, and series 5 or 6 more common (if one might use such a word for such rare cars). But all these 2.5 liter motors, and with the exception of the series 3, are fairly similar. Yes, the series 5 and 6 have a bigger cam and lifters, carburetor,, but these reasonable variations can be readily understood. These changes are minor compared to the early cars – where even the two liter motors in the s. 1 and s.2 are in fact quite different. For these two motors, the heads, the blocks, the pistons are different, the carbs are changed, the intake manifolds are different….wow. This comes about because the s. 1 motor is essentially derived from the 1.8 liter B10 Berlina motor. Its heads use the rocker configuration to that motor, but the s. 1 B20 motor is bigger (2 liter) and has two single barrel carbs, but it has the same cam tho as the Berlina. In the second series motor, things really start to change. While it uses the same cam, this motor has a different rocker orientation (skewed to the crank’s axis, not parallel like the Berlinas), domed pistons, and its carbs are on different manifolds. As a result of the skewed rockers, the heads are different – and unique to the second series. So too, surprisingly, is the block. A comparison of the head gaskets for both motors shows traces of this. Above are shown head gaskets for two liter motors, where it is easy to see differences. 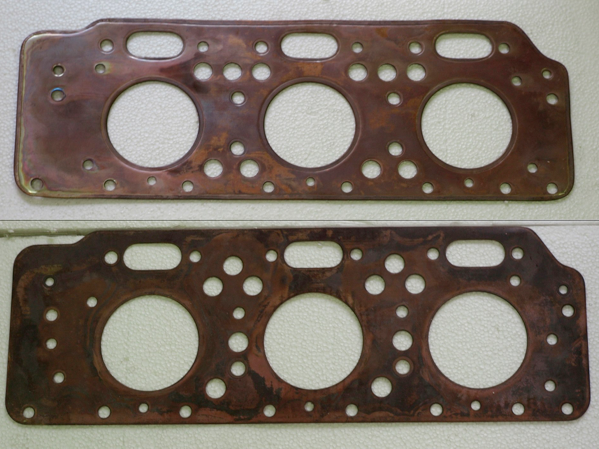 Both head gaskets are old stock – one for the first series, the other second series. So which is which? 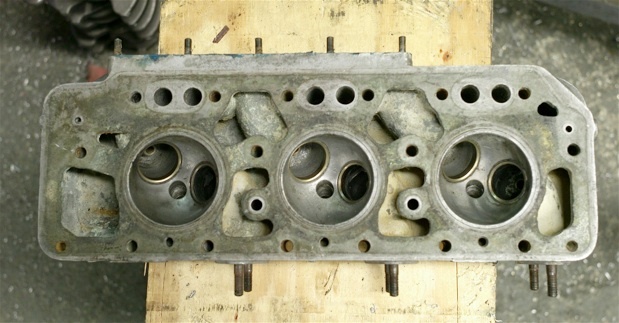 Inspection of the the later s. 2 head reveals large water flow areas in the head, especially in the center, between each of the cylinders, up by the intake and between the pushrods. These show up in the s.2 gasket with there being 3 large circles, between the pushrods, in an angled pattern (see image on left). So too, the s.2 head has larger chambers at both ends of the head, and there is one more hole added at the two sides of the head gasket for this. Big changes in thehead, but only small modifications to the gasket. s. 2 gasket (above), and head below. s. 2 head with rocker arm bases for skewed valves. All the later 2.5 liter engines used this arrangement. None of the Berlinas did.